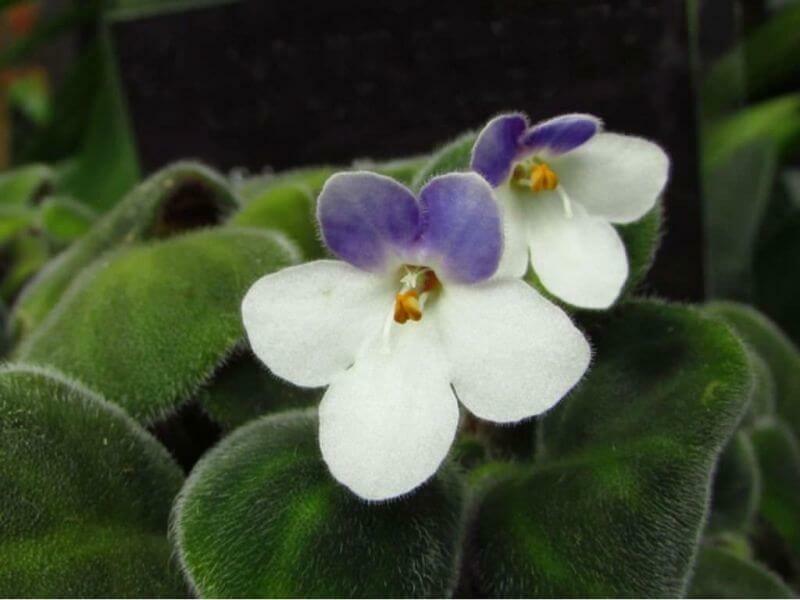 Saintpaulia goetzeana is an ornamental flowering houseplant. It has stems up to 40 cm (16 inches) in length, with leaves of 1.6-3.8 cm (1.5 inches) long and 1.4-3.6 (1.4 inches) wide. The unique flower is with 5 petals, where the top two are violet and the bottom three are white. It thrives best in bright light Leggy stems and no blooms indicate that it’s not getting enough light. 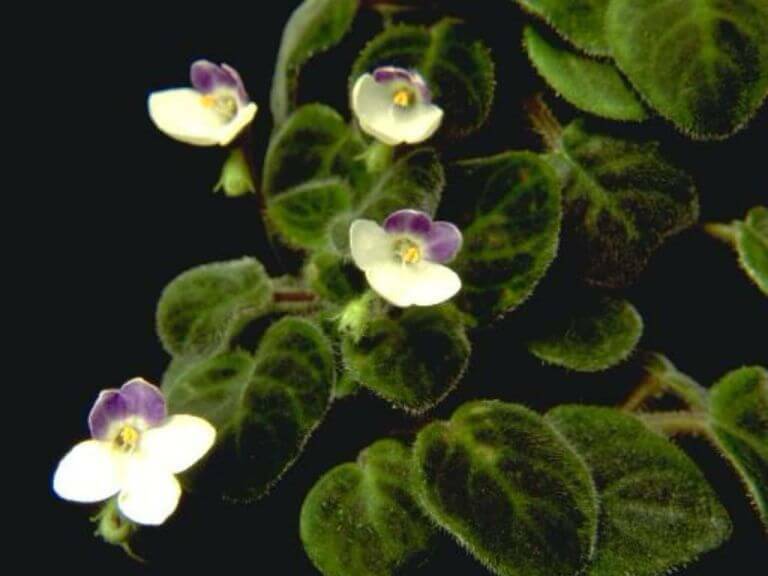 Some direct sun in winter is fine, but strong summer sun will scorch African violet leaves. Also grows well under fluorescent light. It prefers to grow in a rich, organic, well-drained, peat moss-based or African violet potting mix. It prefers moderate to high, aim for 50% relative humidity. It is a good idea to use a humidity gauge because levels can drop drastically in winter. Set plant on a tray of wet pebbles to raise the humidity around it. Do not mist because the water can damage leaves. It grows best in average room temperatures 65°F – 75°F / 18°C – 24°C year-round. Water thoroughly and moderately. Keep the soil evenly moist, but not soggy. During winter, water sparingly. Fertilize once every 2 weeks with a high-phosphorous fertilizer, such as African violet fertilizer. It can be propagated by leaf stem cuttings. Take 5 cm (2-inch) leaf stem cuttings in spring or summer. Dip the cut end in water, then dip it in rooting hormone powder. Poke the stem into the moist potting mix. Use your fingers to firm the mix around the stem so that it stands up. Enclose the whole pot in plastic to hold in moisture. Keep the cutting out of direct sunlight. Leaves should develop roots in about a month, and you should see plantlets form from the base of the cutting in about another month after that. It has no serious pest and disease problems.